The donkey interment inside the circular installation. The find during excavations at Tel Haror in 1992 on behalf of Ben-Gurion University of the donkey’s skull and bit is pictured in situ at the right. Exploration of a ritual burial site in Israel dating back about 3700 years has revealed a donkey, complete with a metal bit in its mouth and saddle bag fastenings. Scientists have described the find in a sacred precinct in Tel Haror, Israel, as unprecedented, providing unique insights into the early use of harness equipment, both for chariot bridling and pack animals. The bit from the bridle (Specimen IAA # 2009-951, The Israel Museum, Jerusalem). “The ritually deposited donkey with its unique accoutrements advances our understanding of the broad social and religious significance of equids in the Levantine Bronze Age,” researchers Guy Bar-Oz, Pirhiya Nahshoni, Hadas Motro and Eliezer Oren wrote in their paper, published in the open-access journal, PLoS ONE. The use of such equipment from that era had previously been known mainly from text sources or illustrations, they said. The researchers, from Israeli universities, said the donkey’s ritual burial dated around 1700-1550 BCE. They said it had been ritually deposited after its sacrifice inside a specially constructed installation in Tel Haror’s sacred precinct, near a diagnostic Syrian-type temple. The sacred precinct in the southwestern corner of the city included the remains of the Syrian-type temple, a storehouse or temple magazine, a spacious courtyard with offering altars and numerous cultic repositories, and auxiliary service structures. “Owing to the relatively arid conditions of the site, the well-preserved burial included the unique occurrence of a donkey being bridled with the mouthpiece of a metal horse bit in its mouth and the metal remains of saddlebags on its back. The find is the only known example of a donkey within a ritual context that was symbolically harnessed with a horse bit and bearing saddlebags, they said. Reconstruction of the saddlebags on the donkey, from a depiction in a tomb painting at Beni Hasan, Egypt. The animal was found fully articulated. “The donkey had been carefully laid on its left side with its head, somewhat elevated, leaning against the wall of the pit and with three of its limbs neatly bent. “The left hind leg seems to have been intentionally broken, perhaps after rigor mortis, so as to fit it into the pit. “Dental wear and eruption and bone fusion of the donkey indicate that it was a young individual, approximately 4 years old. 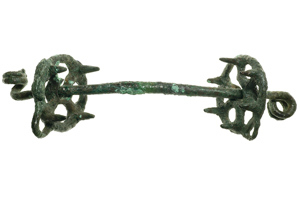 The copper bridle bit was made of a solid-forged, round-sectioned bar mouthpiece and a pair of cast discoid cheek pieces that are studded on their inner face. “The 6.3cm diameter cheek pieces are ‘spoke-wheeled’ and include loops for the attachment of the cheek straps of the headstall and to the central hole for the mouthpiece bar. “It should be noted that the two cheek pieces are not a matching pair. The number of studs correspond to the number of ‘spokes’, four and six, respectively, implying that the bit was assembled from three individual parts that did not originally belong together. The long mouthpiece was finished at both ends by thinning out the bar and then twisting them to form spiraled loops for attaching the reins either directly or by means of rings, the researchers said. “Judging from the size of the spirals, both cheek-pieces seem to have been mounted after the bending of the first spiral and then the opposite spiral was shaped. “Most known examples of this bit type terminate in loops that roll back on themselves and in the same plane. Compared with bits from later periods and modern examples, the mouthpiece from Tel Haror is exceptionally long. “The combination of the long mouthpiece with the studded cheek-pieces would have provided effective leverage that could improve directional control and maneuverability of the animal. “These characteristics are important in horse bridling, especially when used in a draught team pulling a chariot. “It is likely that the reassembled Haror bit was already quite defective when placed in the mouth of the interred donkey and was no longer an effective steering device. Metal fasteners of the saddlebags in situ. “This supposition is supported by the presence of a distinctive gap in both collars of the cheekpieces resulting from extensive wear that would have caused the mouthpiece to flip unevenly back and forth from the central hole to the outer ring. In addition, the pronounced collar that enclosed the central hole in the ‘four-spoked’ cheekpiece seems to have been deliberately broken off so as to enable the reassembly of the complete bit. “This reassembly was achieved by reshaping one end of the bit, which resulted in an imperfect spiraled loop and producing an uneven finish. “The defective state of the bridle bit, as well as the absence of any rings or other fittings usually associated with a headstall and reins implies that this donkey was not fully harnessed with a bridling system. There was no evidence of bit wear on the teeth of the interred donkey, the researchers said. The bridle, though symbolic in function, remained the earliest example and the only one in the ancient Near East recorded in or near the mouth of the equid, they wrote. Excavations of the donkey skeleton exposed a most unusual grouping of 12 corroded copper fittings placed on the upper part of the animal’s rib cage. All of the fittings were shaped like a wide open omega sign, with bent and slightly flattened ends. The fittings were each about 4cm long and 4cm wide and the circular section was 3cm in diameter. They were arranged symmetrically in four rows in an array that created a mirror image on either side of the donkey’s back. “The location, grouping, dimensions and symmetrical placement of the fittings, leads us to suggest that they represent the remains of fasteners for saddlebags composed of decayed organic material, such as leather. “Our hypothesis that the saddlebags were made of leather is based on the assumption that metal fasteners would not have been needed for stitching together sheets of less sturdy materials such as linen, wool or vegetal fiber, which can be sewn together with fiber cords. The discovery of the metal bridle bit bears on the early history of the light chariot in the Levant and Egypt and its eventual incorporation into military use, the authors said. “Evidence from historical and iconographic sources indicates that light, horse-drawn chariots (primarily for military use) were already known in the ancient Near East by the 18th century BCE. “The Tel Haror bridle bit provides the first archaeological evidence found in situ in a clear Middle Bronze Age context dated to the periods between the 17th or mid-16th centuries BCE. Map showing Tel Haror and other sites mentioned in the text. “Evidence from texts and iconographic depictions from the Near East shows that donkeys were ridden or driven with a neck rope, nose ring or nose band. Harnessing of a donkey with a bridling system was so far unknown. The saddlebags were the earliest archaeological evidence for equid-borne panniers in the Levant and Egypt prior to the Iron Age, the authors said. “The Tel Haror saddlebags may have been crafted specifically for the occasion of the donkey burial in the temple precinct. This suggestion is supported by the distinctively small-sized bags and the ritual context of the specimen. “The association of the Tel Haror donkey sacrifice with a bridle bit and saddlebags may suggest that, prior to the killing, a ceremony was performed in the temple courtyard. “The deposition of a fully articulated donkey testifies that the animal was not consumed and that the ceremony may have been concluded with a ritual meal or a feast,” they said. “The donkey of Tel Haror with its bridle bit and saddlebags reflects significant social, economic and technological developments related to the use of equids in the Near East,” they concluded.